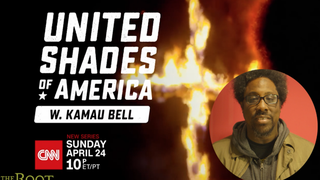 Your favorite comedian's favorite comedian, W. Kamau Bell, has a new show coming out on CNN called United Shades of America. And not only is the title a clever play on words, but the concept of the show is brilliant. In this original series, Bell will explore subcultures across the country, all while using comedy to get a conversation going about race and how our differences unite and divide us. Every Sunday at 10 p.m. EDT for the next eight weeks, we get to see Bell go from the far corners of Alaska to Florida's retirement homes to America's most notorious prison. The point is to reveal the diverse and colorful definitions of America, across America. See, told you … brilliant! In the premiere, which airs Sunday, April 24 (right after Anthony Bourdain: Parts Unknown), Bell heads to the South to challenge the "new" Ku Klux Klan. This generation of Klansmen claims that it has rebranded, and, of course, Bell is there to see for himself. Hilarity and clarity are sure to ensue. Bell stopped by The Root's office to tell us all about the show, but because he's a brilliant comedian, we decided to do a skit in which Bell has to pitch United Shades of America to us. The resulting skit is a comedic masterpiece, but it's no United Shades of America. Check it out!